Japan’s sixth HTV supply ship is slated to depart a picturesque spaceport on Tanegashima Island on Friday to start a four-day pursuit of the International Space Station with a cache of experiments, supplies and six lithium-ion batteries to begin overhauling the orbiting lab’s vast electrical system. The barrel-shaped spaceship is set for liftoff at 1326:47 GMT (8:26:47 a.m. EST; 10:26:47 p.m. Japan Standard Time) on top of an H-2B rocket specially designed to loft Japan’s heavy cargo carriers heading for the International Space Station. 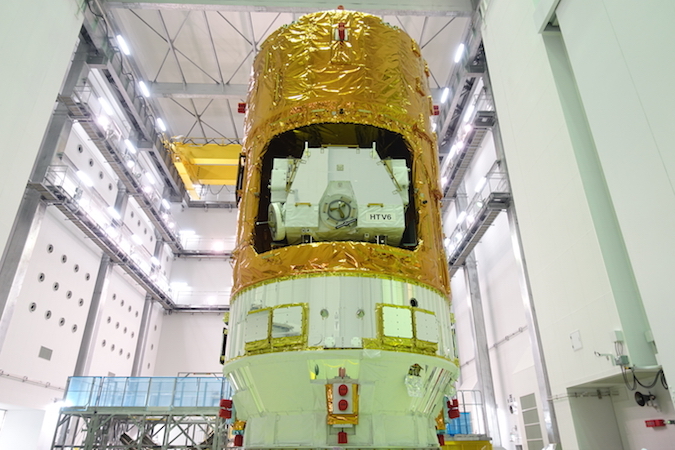 Japanese technicians packed the HTV supply ship, known by the name Kounotori 6, with 9,080 pounds (4,119 kilograms) of cargo and packaging ahead of launch, according to NASA. The largest chunk of the HTV’s cargo manifest comes from six lithium-ion batteries flying inside the spaceship’s unpressurized cargo hold. Packing materials account for the rest of Kounotori 6’s total load, which also includes 600 liters — about 158 gallons — of fresh water for the space station’s six-person crew. Friday’s launch will be the first toward the space station since a Russian Progress supply ship crashed back to Earth following a failure of its Soyuz rocket Dec. 1, the fifth such accident on a station cargo mission since 2011. But Japan’s HTV missions have a perfect record on five previous missions since the robotic freighter first flew in September 2009, and space station managers are counting on the coming mission to resume successful cargo deliveries. The next launch dates for two of the station program’s four cargo vehicles — Russia’s Progress and SpaceX’s Dragon — are uncertain as both of the spaceship’s launch vehicles are coming off failures. Despite the loss of the Russian Progress mission last week, space station officials elected not to add any unplanned cargo to Kounotori 6, a NASA spokesperson said. Mounted on top of a mobile launch platform, the H-2B rocket rolled out of its vehicle assembly building at the Tanegashima Space Center around 6:30 a.m. local time Friday (2130 GMT; 4:30 p.m. EST Thursday) for the trek to Launch Pad No. 2 at the island space base. The 1,600-foot (500-meter) journey took around 30 minutes, and was followed by procedures to connect the H-2B’s launch platform with ground supplies feeding electricity, telemetry and propellants. Launch crews with Mitsubishi Heavy Industries, the H-2B rocket’s builder and commercial operator, planned to load thousands of gallons of super-cold liquid hydrogen and liquid oxygen propellants into the 186-foot-tall (57-meter) rocket during Friday’s countdown to power the launcher’s first and second stage engines. In the countdown’s final hours, the launch team will check the steering systems on the rocket, verify telemetry links with ground stations, and check out the H-2B’s destruct mechanism. 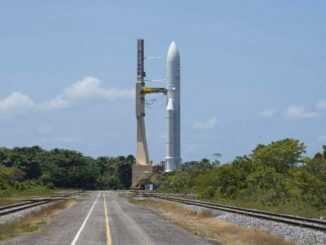 The rocket’s two LE-7A main engines will ignite about five seconds before liftoff, consuming a mixture of cryogenic liquid hydrogen and liquid oxygen. The H-2B’s four solid rocket boosters will fire with a rush of orange-hot exhaust at T-0, driving the launcher off the pad on more than 2.5 million pounds of thrust. Moments after clearing the launch pad, the H-2B’s engine and booster nozzles will swivel to direct the launcher on a southeast trajectory in line with the space station’s flight path. The four strap-on solid rocket motors will empty their propellant canisters and release from the H-2B’s foam-covered first stage around two minutes into the mission. The clamshell-like aerodynamic fairing enclosing the HTV supply ship will jettison at T+plus 3 minutes, 40 seconds. The twin-engine first stage will cut off at T+plus 5 minutes, 47 seconds, following by stage separation seven seconds later, then ignition of the second stage’s LE-5B powerplant for a burn slated to last more than eight minutes to inject the massive cargo carrier into orbit. Deployment of the HTV is expected at T+plus 15 minutes, 11 seconds, according to information released by the Japan Aerospace Exploration Agency. From there, the HTV will start its journey to the space station, setting course on a four-day chase set to culminate with an automated rendezvous Tuesday. The Japanese cargo freighter will fire its thrusters multiple times this weekend to set up for Tuesday’s arrival. NASA space station commander Shane Kimbrough and European Space Agency astronaut Thomas Pesquet will be at the controls of the research outpost’s Canadian-built robotic arm Tuesday, using the device to reach out and grapple the HTV as it floats around 30 feet (10 meters) below the complex. Astronaut Peggy Whitson will monitor the HTV’s systems from a control panel inside the space station. Once in the grasp of the robot arm, Kounotori 6 will be berthed to the Earth-facing port on the station’s Harmony module, and astronauts will open hatches leading into the supply ship to begin unloading cargo inside its pressurized cargo module. Meanwhile, a pallet holding the station’s new lithium-ion batteries will be robotically removed from the HTV’s external section. The new batteries are lighter and more efficient replacements for the station’s current nickel-hydrogen batteries, with six of the lithium-ion units taking the place of 12 of the existing batteries. The station’s Dextre robotic handyman will unbolt and remove the 12 old batteries from the research lab’s starboard-side S4 power truss, one of four huge solar array sets affixed to both ends of the space station’s structural backbone. The robot will install the six replacement batteries, then place nine of the 12 old ones back on the HTV’s cargo pallet. With the help of astronauts on two spacewalks — currently penciled in for Jan. 6 and Jan. 13 — three other batteries will be placed on adapter plates for long-term storage outside the station. There is not enough room on the HTV cargo pallet for all 12 of the nickel-hydrogen batteries. 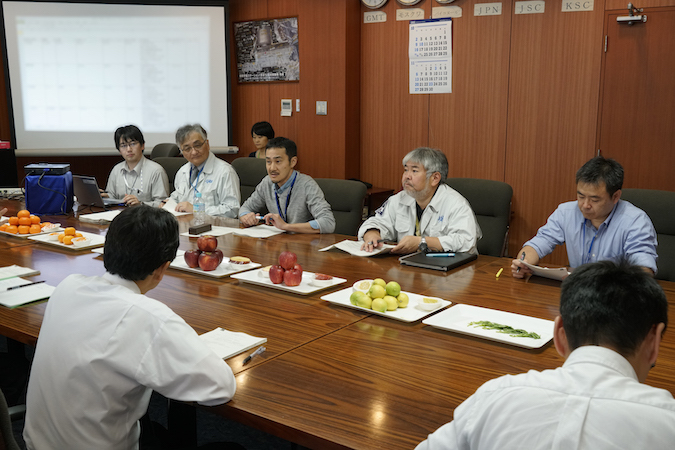 The Kounotori 6 mission will deliver the first six of 24 lithium-ion battery units to replace the space station’s aging nickel-hydrogen batteries. 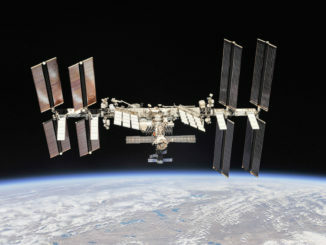 Six of the oldest batteries, which launched with the station’s first solar array trust segment in 2000, were changed out with new nickel-hydrogen units on a space shuttle mission in 2009. 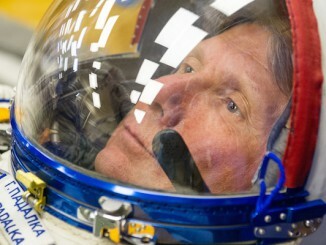 The oldest remaining batteries, made by Space Systems/Loral, are also now beyond their design lifetimes. After this launch, engineers are working on 18 additional lithium-ion battery sets to fly on three more Japanese HTV missions set for launch in 2018, 2019 and 2020. The new lithium-ion batteries should operate for at least 10 years — longer than the space station’s planned remaining lifetime. Each new unit weighs about 550 pounds (250 kilograms) provides the same energy storage capability as two of the current nickel-hydrogen batteries. The next-generation batteries were assembled by Aerojet Rocketdyne with cells supplied by GS Yuasa Lithium Power Inc., a Roswell, Georgia-based subsidiary of GS Yuasa Corp. of Japan. GS Yuasa says it has lithium-ion battery cells on more than 120 government and commercial satellites, including the H-2B rocket and HTV cargo carrier slated to launch the station’s new batteries. The HTV is the only cargo transporter that can carry a large number of battery units, according to JAXA. The schedule calls for Kounotori 6 to depart the space station Jan. 20, but it will spend another week in orbit conducting an experiment that could lay the foundation for a mechanism to remove space junk from orbit. The spaceship will unreel a nearly half-mile-long (700-meter) tether, made of strands of thin aluminum and stainless steel wire, once at a safe distance from the space station, and scientists will monitor the device’s deployment and behavior for about seven days. 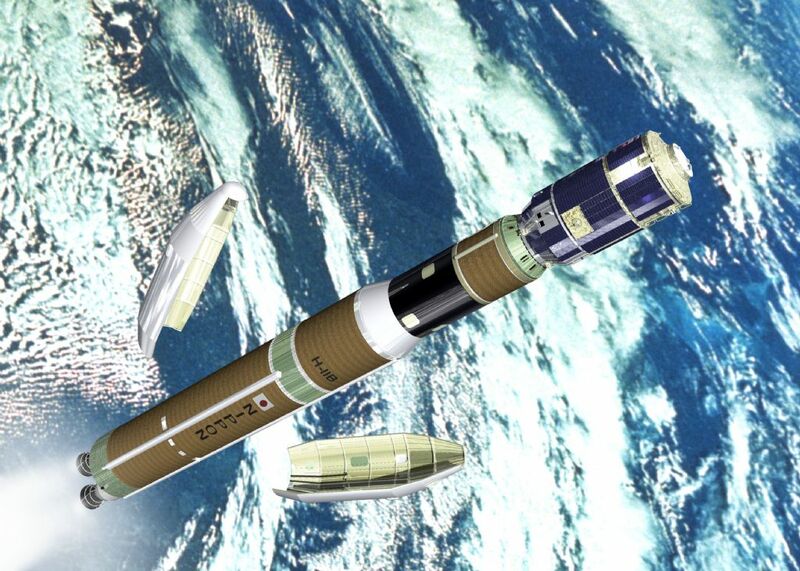 Space debris experts say electrodynamic tethers like the one carried on Kounotori 6, which has a thin coating of lubricant to encourage electric conductivity, could offer a way to de-orbit derelict rocket stages and aging satellites without expending precious propellants. The interaction between an electrodynamic tether and the Earth’s magnetic field should generate enough energy to change an object’s orbit, eventually allowing it to burn up in the atmosphere. Japanese ground controllers will sever the tether after about a week to keep it from interfering with the HTV’s own destructive re-entry, which will be guided by conventional rocket thrusters in a de-orbit burn. The ship will dispose of several tons of space station waste and the station’s disused nickel-hydrogen batteries.